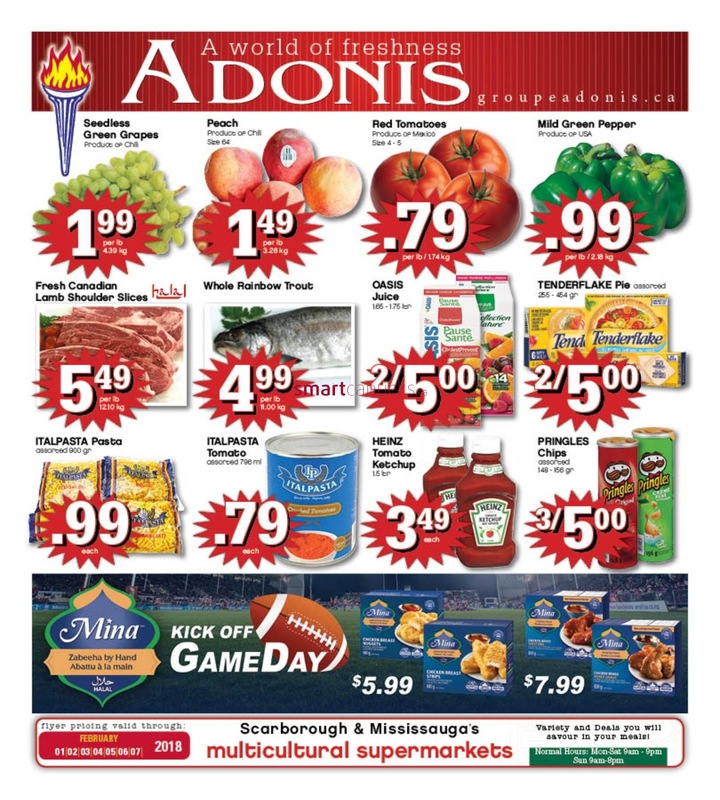 Marche Adonis Canada Flyer February 2 - 8, 2018 FIVE ROSES All Purpose White Flour FIVE ROSES 9.99 each. ULKER Rulokat WaPer Roll Cream Strawberry, Chocolate Dark or Coconut 230 gr 2.99 each. MISKO Vermicelli or VALDIGRANO Fidelini Pasta 250 gr .79 each. KELLOGG'S Cereal -all bran 500 gr, Mini wheat 500 gr Fruit Loops 590 gr; Rice Krispies 64O gr, Frosted Rakes 650 gr 4.44 each. CEDAR Sliced Jolopenos or Pickled Turkish Cucumber 500 ml 1.49 each. TOSTITOS Chips assorted 205 - 432 gr or Salsa 423 ml 2/6.00. 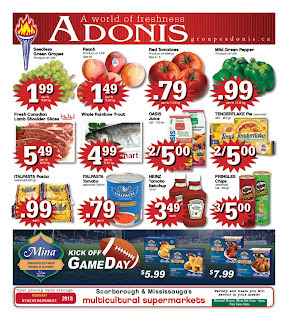 Marche Adonis Canada Flyer UBERTE Greek Yogurt assorted 750gr 4.99 each. SANTA LUCIA Fior Di Lotte Mozzarella Cheese 250 gr 3.99 each. 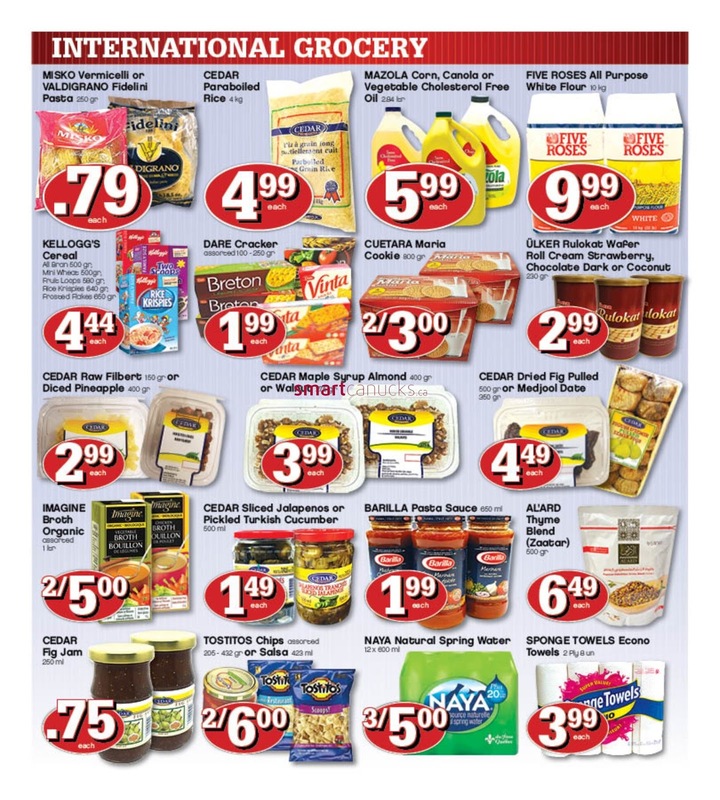 ASTRO Original or Plain Yogurt ;assorted 650 - 750 gr 1.99 each. CEDAR Frozen Peas and Carrot or Green Peas 175 kg 3.99 each. ALFA Kihi Feta Cheese Fib Mini Rolls 900 gr 4.99 each. Fresh Candian lamb shoulder slices 5.49 per lb 12.10 kg. ITALPASTA pasta assorted 900 gr .99 each. Marche Adonis Flyer seedless green grapes porrodect OP CHili 1.99 per lb 4.39 kg. Peach product op chili size 64 1.49 per lb 3.28 kg. Whole Rainbow Trout 4.49 per lb 11.00 kg. ITALPASTA Tomato assorted 796 ml .79 each. 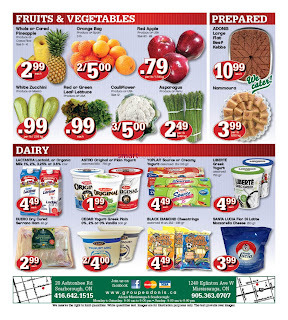 CHAPMAN'S Ice Cream or Sundae assorted 2 ltr 2.99 each. ROYAL HARBOUR Shrimp & Scallop 340 gr 6.99 each. 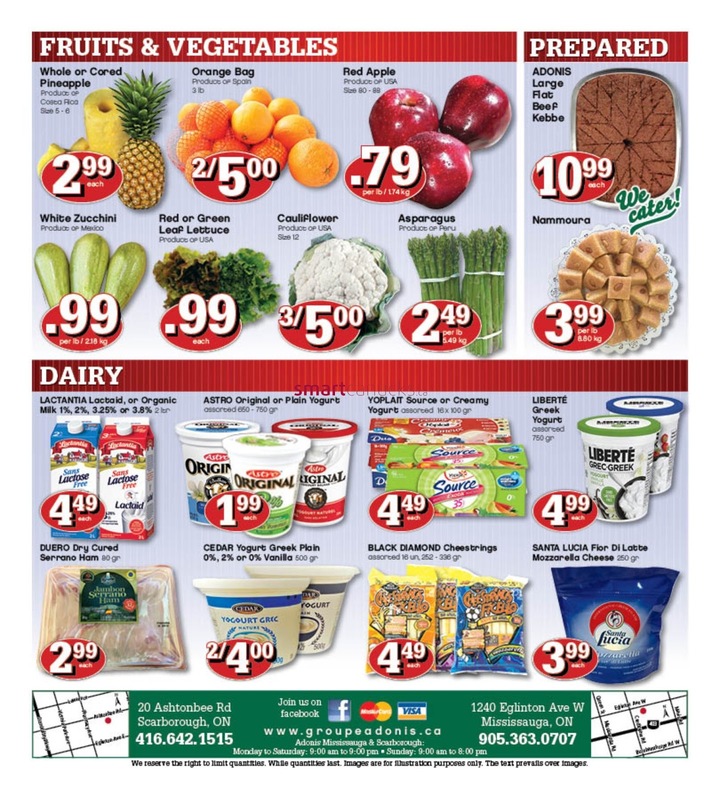 Canadian Feta Cheese 3.99 per lb 8.80 kg. 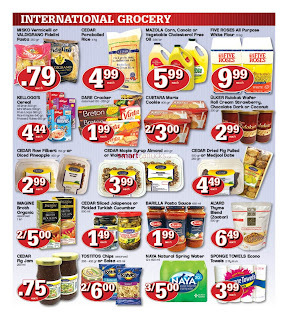 Havarti Cheese regular or jalapena 7.99 per lb 17.61 kg. FRICO Smoked Gouda Cheese 8.99 per lb 19.81 kg. CEDAR Yogurt Greek Plain 0%. 2% or 0% Vanilla 500 gr 2/4.00. YOPLAIT source or creamy Yogurt assorted 16 x 100 gr 4.49 each. BLACK DIAMOND Cheestrings assorted 16 un, 252 - 336 gr 4.49 each.